Bridger Bishop Interns with SHPO, photographing sites in Nevada to prepare them for the National Register of Historic Places application. 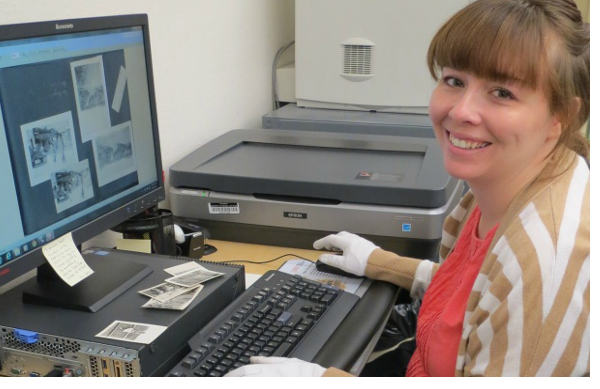 Angela Moore interns with UNLV Lied Library's Special Collections. Shae Cox intern's at the Mob Museum and assists during a photoshoot for the Content Department. Scrubbing 1930s ranching tools that had been stored in a barn for half a century; picking up sequins that have fallen from Liberace’s costumes; cataloging more than 25,000 lapel pins worn to show solidarity for local labor strikes. Internships in the public history program may not always be glamorous, but they do serve an important purpose. Public history is about rolling up your sleeves, digging in, working with others, and making the most of what you have. Internships teach students how to do that. Our internships in public history require 120 hours of on-site experience. Students typically complete these hours over the course of a summer. Working under the supervision of the Director of Public History Deirdre Clemente, the student partners with an institution or organization related to their area of interest, and completes the terms of the internship. Students have often stayed on to work as volunteers or employees after they have completed their hours. In the past, students have completed internships with the National Park Service, the Museum at FIT, the Mob Museum, the Office of Historic Preservation at the City of Las Vegas, The Liberace Foundation, The New Bureau at the Las Vegas Convention and Visitors Authority (LVCVA), the Clark County Museum, Special Collections at UNLV’s Lied Library, and The Hard Rock Hotel and Casino. UNLV Special Collections Blog - "A Note on Sovereignty"